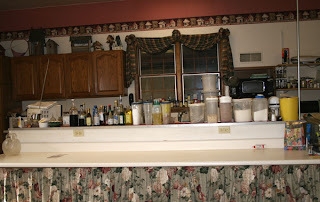 Behind this counter, you can see my kitchen area. I do all my cooking and canning out here. I have lots more room than I do in my "real" kitchen in the house and everything is very convenient. I have rubber mats on the floor, so if something gets spilled it does not ruin the carpet. I will get a better picture of it some day, but right now I have all my soap making supplies out and it looks a little messy. I sure don't want you to see the mess.